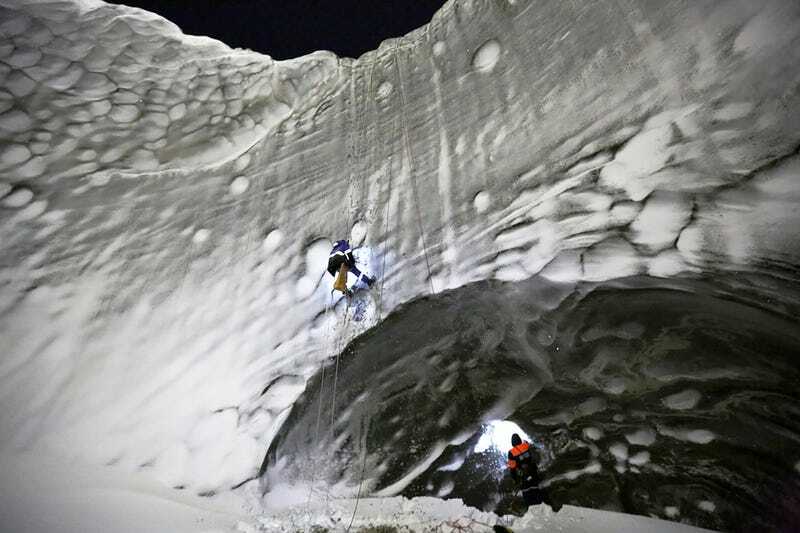 The Siberian Times just published these new amazing pictures of an expedition of scientist who descended inside the mysterious crater on the Yamal Peninsula, northern Siberia. They are collecting data because its origin remains a mystery but, believe it or not, there may be a Bermuda Triangle connection. There is a version that the Bermuda Triangle is a consequence of gas hydrates reactions. They start to actively decompose with methane ice turning into gas. It happens in an avalanche-like way, like a nuclear reaction, producing huge amounts of gas. That makes ocean to heat up and ships sink in its waters mixed with a huge proportion of gas. The same leads to the air to get supersaturated with methane, which makes the atmosphere extremely turbulent and lead to aircraft crashes. I've heard about this Bermuda Triangle idea, but I repeat, our scientists need to work on materials first and only then draw some definite conclusions. At the moment we don't have enough information. Pushkarev says that it was easy to descend while the hole is solid because of the ice. In the summer the sides of hole were soft. At the bottom the lake—which is about at least 10 meters deep—is frozen.